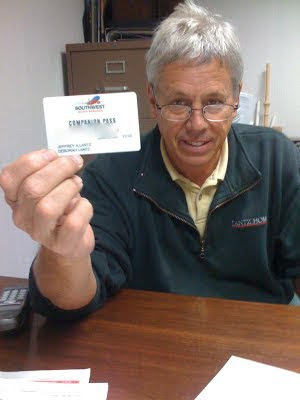 Just in case dad didn't tell you - He finally has earned his Southwest companion pass and is so proud of it. He is telling everyone he sees and can't stop talking about it. This pass has been consuming him for weeks now. This pass will now allow him to take a special someone for Free every time he flies. This special someone will be mom and what a lucky lady you are. Dad there is also someone else in this family that has a companion pass and he didn't know it until this afternoon. I knew it back in the spring when I found a letter from Southwest congratulating Mark on his status. I showed it to him and he didn't believe me. I think he just didn't want to bring his special someone with him. I had Mark call today when I saw dad's letter. What do you know....he has had a companion pass since last February. I should have made that call. Wow, how do you get one of those? With all the flying my parents and Dave's parents do to St. Louis, I would think they should get something like that soon.